Amber wakes up in a hospital. She can't move. She can't speak. She can't open her eyes. She can hear everyone around her, but they have no idea. Amber doesn't remember what happened, but she has a suspicion her husband had something to do with it. 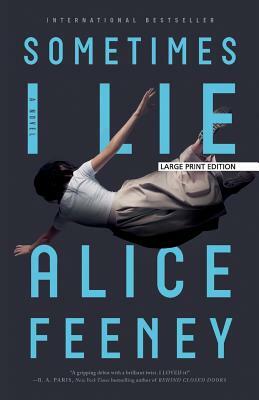 Alternating between her paralyzed present, the week before her accident, and a series of childhood diaries from twenty years ago, this brilliant psychological thriller asks: Is something really a lie if you believe it's the truth? Alice Feeney is a writer and journalist. She has spent fifteen years with BBC News where she worked as a reporter, news editor, arts and entertainment producer, and One O'Clock news producer. Alice has lived in London and Sydney and has now settled in the Surrey countryside, where she lives with her husband and dog. Sometimes I Lie is her debut.